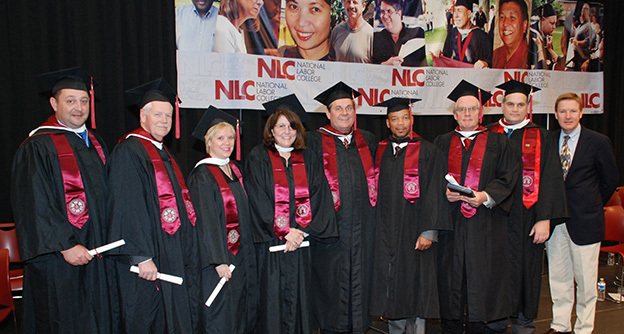 The IAM had one of the largest groups in the National Labor College’s 2014 graduating class including, from left, Scott Walker, James Smith, Kathlene Mirgon, Donna Perinetti, Marcus German, Edison Fraser, Alastair Haythornthwaite and Michael Garofano (not in photo: John Gehringer, Andrew Marnhout, Linda Seeley, Steven Warren and David Wheatley). Appearing with the graduates, right, is Chris Wagoner, director of the IAM’s William W. Winpisinger Education Center. Labor’s college may be closing up shop, but not because IAM members didn’t participate. In 2014, and almost every year since the IAM’s William W. Winpisinger Education Center teamed up with the AFL-CIO’s National Labor College (NLC) in Silver Spring, MD, the IAM has had one of the highest graduation rates of any participating union. The unique partnership between the IAM and the NLC enabled IAM members to complete many of the NLC’s degree courses at the Winpisinger Center. This year’s 13 IAM graduates brings the total number of IAM members to earn degrees from the NLC to more than 110. The 2014 graduating class includes Edison Fraser, Transportation Grand Lodge Representative; Michael Garofano, FL 1998; John Gehringer, Local 297; Marcus German, Local 733; Alastair Haythornthwaite, District 250 Business Rep.; Andrew Marnhout, FL 1855; Kathlene Mirgon, Local 2259; Donna Perinetti, Eastern Territory Education Rep.; Linda Seeley, Grand Lodge Auditor; James Smith, Eastern Territory Grand Lodge Representative; Scott Walker, FL 1153; Steven Warren, District 751 Business Rep., and David Wheatley, Local 63. At the Commencement ceremony, IAM members Linda Seeley and Alastair Haythornthwaite were honored with Outstanding Paper Awards. Their work was selected as a “testament to their commitment to excellence and reaching the high standard that the NLC faculty expect of all our students,” said NLC President Paula Peinovich. The 2014 graduation was also the closing convocation for the college, and featured speakers from the NLC board, faculty, students from the first and 2014 NLC graduating classes and a keynote address by AFL-CIO President Richard Trumka. Although the NLC has ended its instructional program at the Meany Center, the college has arranged a “teach-out” program with other institutions to give students who have begun a degree program a chance to complete it over the next 18 months. For more information about earning a college degree, contact Rhonda Rogers at the Winpisinger Center at 301-373-3300 or email rrogers@iamaw.org.